The Current KEGS Curriculum Model- see the link below for the proper Excel version. A few years ago I undertook an information gathering exercise for the Grammar Schools Heads’ Association, collecting over 70 different curriculum models. I asked people to send me their model in a format that matched our own, using Excel, so that it was easy to browse through all of the models in the same format using the tabs in a single workbook for easy visual comparison – people preferred this to a table of figures. Click the tabs along the bottom to see each one. It should print out as one booklet with ready-formatted pages if you select the ‘print workbook’ option. I will update from time to time as the models come in. Interestingly, no two models from the original 70 I gathered are the same although there are lots of common features. A two-week timetable of 50 hour-long lessons is the most common – like the KEGS model. However, four KS4 options is the most common -whereas KEGS offers five. 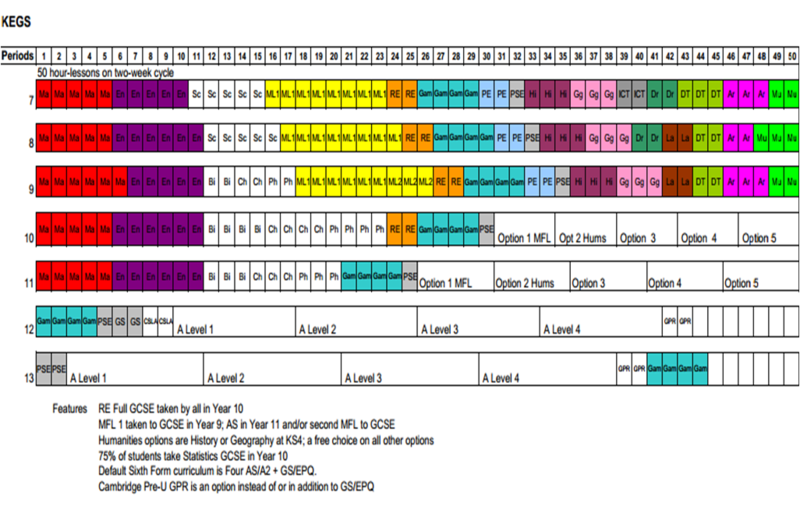 There is then all manner of variation of time allocated to each subject at KS3 and KS4. I find it fascinating. I am now keen to collect models from a broad selection of schools including where there are different choices or setting/banding pathways within each year group. If you would like to share your curriculum model, please send me an email (tsherrington@highburygrove.islington.sch.uk) with a model in the same Excel format of the others. I will stitch them all together and refresh the master sheet including any I receive. (I won’t process or include any that are not presented exactly the same way). It’s especially helpful if they are pre-formatted to print out on one page. You can add explanatory notes at the bottom if that helps to get the details. I will include your school’s name if you wish, or not if you’d rather not. « Reading and Not Reading. The books I read. Finally. My intention is to share it with everyone, updating it periodically. I’m hoping that people will contribute freely if they work in a school – that seems reasonable. They just need to get it into the common format. If you have a model to share, please do. Useful article possibly giving all the curriculum changes upon us ….. I prefer the traditional format.